Biotech, pharmaceutical and medical companies could catch a bit of a tailwind Thursday, after analysts at Evercore ISI initiated positive coverage on 14 stocks in the sector. Three notable calls center around BioMarin Pharmaceutical Inc (BMRN - Get Report) , AbbVie Inc (ABBV - Get Report) and Regeneron Pharmaceuticals Inc (REGN - Get Report) . Analyst Josh Schimmer initiated coverage of Regeneron with an outperform rating and $605 price target. Based on Wednesday's closing price near $468, the price target implies about 30% from current levels. That's quite a bit of upside, especially considering REGN stock is up more than 25% since the end of April. Schimmer also has a bullish outlook on BioMarin, which he slapped with an outperform rating and $100 price target. It implies about $17 a share of upside from its current price near $83, a gain of more than 20%. Finally, Schimmer placed an outperform rating and $95 price target on AbbVie, which most recently closed near $70. The near-$25 per share of potential upside would represent a gain of more than 35%. 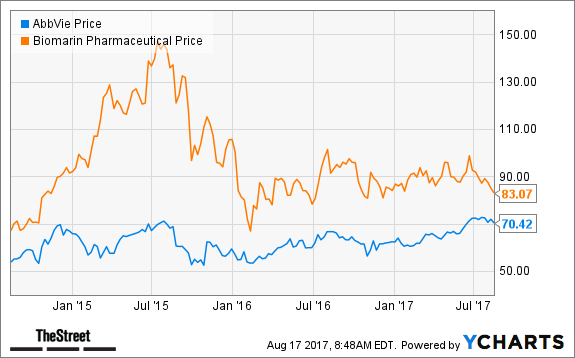 Other notable outperform ratings from Schimmer include Shire PLC (SHPG , which received a $196 price target, Ionis Pharmaceuticals Inc (IONS - Get Report) , which received a $65 price target, and GW Pharmaceuticals (GWPH , which received a $154 price target.